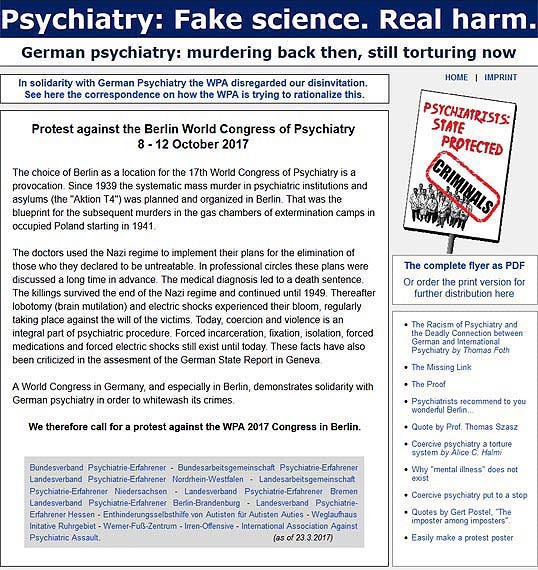 On the contrary, it has now become apparent how connected world psychiatry is with the murderous psychiatry. Loss of power: With the PAD PatVerfue one can escape the violent grasp of psychiatry. 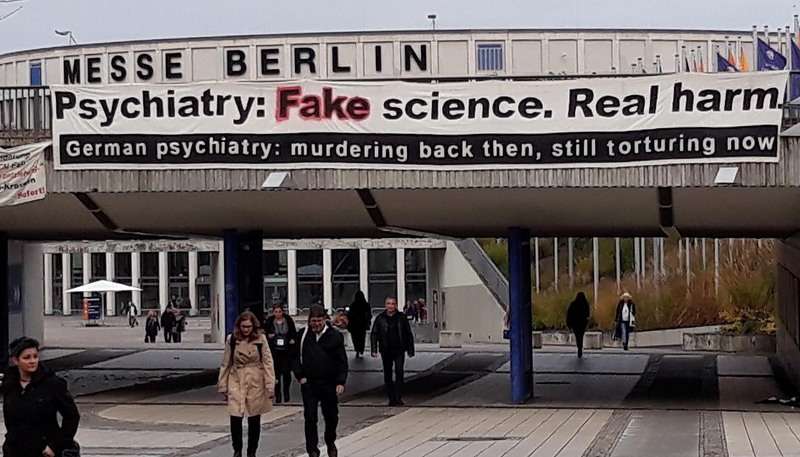 It is so far only possible in Germany, but nevertheless this PAD decomposes coercive psychiatry fundamentally because its imagined absolute necessity or indispensability is refuted. The psychiatric apparatus thus becomes obsolete. The psychopharmaceutical research funding has been canceled due to a lack of prospects for success; basic research has shown that basic psychiatric assumptions are false or invalid. Thomas Insel, the director of the National Institute for Mental Health (NIHM) in the USA, finally admitted in a NIMH publication on April 29, 2013 that up till now all psychiatric diagnonsense has no validity at all. 2/5/2017: Day of Remembrance and Resistance 2017 – Psychiatry: Fake science. Real harm. 17/1/2013: Now obvious: Psychiatry is brute force! 18/6/2009: Finally, coercive psychiatry can be put to a stop! Speech as introduction to the première of the cinema commercial for the PatVerfue on 31st January 2012 in the cinema Moviemento. since the 1st of September 2009 a new law is in force for advance medical directives without limitations for illnesses or phases of illnesses! The consequences for these three professions are spelled out in these notes. Here are the winners of the prize-winning competition to find an appropriate slogan to criminalize all those who work in a locked psychiatric ward. Letter from IAAPA to the High Commissioner for Human Rights in Geneva in support of stopping the convention fraud in Germany. Blog: Behaviorism and Mental Health – An alternative perspective on mental disorders by Philip Hickey, PH.D.